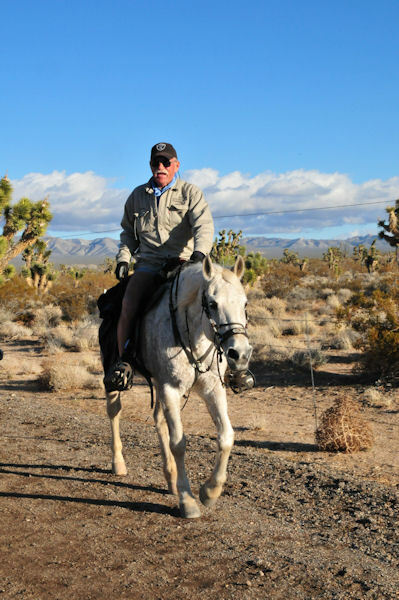 Les Carr's Tulip reached 22,000 career miles on Day 4 of the Eastern Mojave Classic on February 20, 2011, with Dave Rabe in the saddle. Tulip became AERC's highest mileage horse in the 2006 Death Valley Encounter with Les Carr, passing the previous high mileage horse, Rushcreek Lad (18,215), owned by Trilby Pederson. He reached 20,000 miles in May of 2009. Tulip, a 22-year-old Morab gelding, is 15.2 hands and excels in 50-mile multi-day rides. Les Carr, 75, has 47,000 AERC miles himself. And neither show signs of slowing down. Veterinarian Sid Vargas of El Paso, right, checks the physical condition of a horse at the Graham County Fairgrounds during the Springdale Romp, a distance riding event, on Tuesday. Riders are required to vet their horses the day before the ride, halfway through the ride and after the ride. 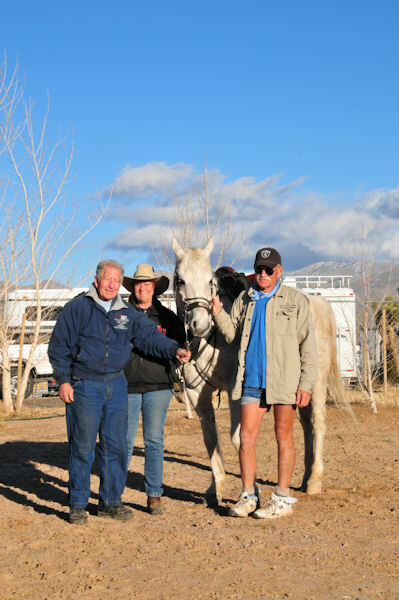 Thirty-three riders (61 were expected but many couldn’t make it due to bad weather) from across the country came to Safford to compete in endurance rides. * Assist the High Performance Committee in the development and implementation of the Endurance Strategic Plan with the primary goal of winning a team medal with Individual placements in the top ten in World Endurance Championships. * Educate and train riders who are interested in competing in international/FEI competitions. This will include developing clinics and sourcing clinicians who can provide the necessary training and education in areas such as horse physiology, classical riding skills, nutrition, horseshoeing, and race strategy. * Develop an annual budget in conjunction with the Endurance Director that supports the program’s goals. * Exercise the judgment and discretion in the manner and means necessary to accomplish the goals of the job. * Ability to successfully work with athletes, officials, veterinarians, and fellow USEF staff members. * Foresight and vision to develop and nurture an endurance program that will result in the winning of medals at international competitions. * A strong understanding and knowledge of endurance and a superior understanding of race strategy. * Provide the assurance that no personal conflicts exist that may hinder the candidate’s ability to perform the job. * Ideally this position will be filled by June 1, 2011 providing a qualified candidate is found. * The position will last through the 2014 World Equestrian Games. * This job description is subject to change dependent upon the individual candidate’s qualifications and skills. Visit http://usngbjobs.teamworkonline.com/teamwork/r.cfm?i=34086 to apply for this position. Endurance riders will tackle new routes at this year's Golden Horseshoe Ride on Exmoor (15-17 May), with organiser Barbara Wigley hoping that leading partnerships will use the 160k (100 miles) class en route to selection for the European Championships. "The 160km class is possibly the most demanding on the British calendar and is ideally suited to riders looking towards international competition," said Mrs Wigley. Home International chef d'equipe Maggie Pattinson said she would encourage all top riders to compete. "Years ago, people would head to Exmoor to get some hard work under their belts," she said. "We've gone through a phase of being a bit soft and worried the horse might break — but we've got to see if these horses are fit enough..."